2008 and 2009 will be remembered for bear markets, a global credit crunch, and some of the largest investment scams ever. But these scams are nothing new, they've been repeated throughout history, and there will certainly be more to come. But the good news is fraudsters often follow the same basic playbook. Learn the playbook, and know how to ask the right questions, and financial fraud can be easy to detect and simple to avoid. 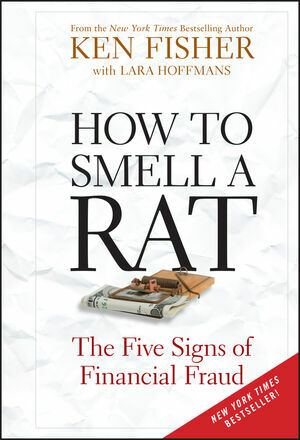 In How to Smell a Rat, trusted financial expert Ken Fisher provides you with an inside's view on how to spot financial disasters before you become a part of them. Filled with in-depth insights and practical advice, this reliable resource takes an engaging look at recent and historic examples of fraudsters, how they operated, and how they can be easily avoided. Fisher also shows you the quick, identifiable features of financial frauds and arms you with the questions to ask when assessing a money manager. With How to Smell a Rat as your guide, you'll learn how to protect your interests and assets from unnecessary losses. KEN FISHER is best known for his prestigious "Portfolio Strategy" column in Forbes magazine, where his twenty-five-year tenure of high-profile calls makes him the fourth longest-running columnist in Forbes' 90-plus-year history. Ken is the founder, Chairman, and CEO of Fisher Investments, an independent global money management firm. He is on Investment Advisor magazine's prestigious IA-25 list of the industry's most influential people; is the award-winning author of numerous scholarly articles; and has published five previous books, including the New York Times bestsellers The Only Three Questions That Count and The Ten Roads to Richesboth of which are published by Wiley. Ken has been published, interviewed, and/or appeared in most major American, British, and German finance or business periodicals. He has a weekly column in Focus Money, Germany's leading weekly finance magazine. LARA HOFFMANS graduated from the University of Notre Dame with a BA in theatre. She is a content manager at Fisher Investments and contributing editor of MarketMinder.com. She also coauthored with Ken Fisher the bestsellers The Only Three Questions That Count and The Ten Roads to Riches.